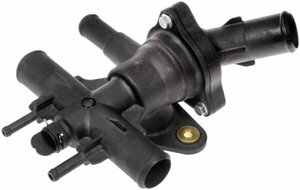 Re-engineered to address common failure points in the original equipment, Dorman's Engine Coolant Thermostat Housing has improved durability and resistance. It withstands the extreme changes in temperature that frequently cause housing to become brittle, crack and leak. This is more than a replacement";" it's an upgrade. Maintain the steady flow of coolant and lessen the chances of overheating.